Approximately 95 percent of those with diabetes have type 2 which is a condition that affects the way your body metabolizes sugar (glucose). Nearly 17 million Americans have it and it is the seventh leading cause of death in the U.S. Previously associated with people in middle age or older, type 2 is on the increase in children due to the dramatic increase in obesity. It has been estimated that about a third of all children being born today will eventually get diabetes. With these facts in mind, everyone should be aware of the type 2 diabetes risk factors. Obesity: Being overweight is the number one type 2 diabetes risk factor. the number of people with diabetes who are at some level of obesity is double that found in the population without the disease. The Body Mass Index (BMI) is the standard for determining body weight relative to health for most patients in the age group of 20 to 65 (excluding the highly conditioned such as athletes, or women who are nursing or pregnant.) A Body Mass Index in excess of 27 signals a risk for type 2 diabetes, and other complications such as heart disease, and early death. Apple-shaped figure: Having an excess of fat above the hips usually means a greater risk factor for type 2 diabetes than for those who have a pear-shaped figure (excess of fat in the thighs and hips). Men with a waist size larger than 39.5 in. (100 cm), and women, 37.5 in. (95 cm) are at increased risk. Age: This type 2 diabetes risk factor increases with age. Those over 45 are at a greater risk than their younger counterparts and those over 65 are three times as high as people in the 35 to 64 age group. Sedentary lifestyle: Exercising regularly and keeping your weight under control reduces your chances for getting type 2 diabetes. Those who have the disease should see an improvement in blood sugar levels as well. 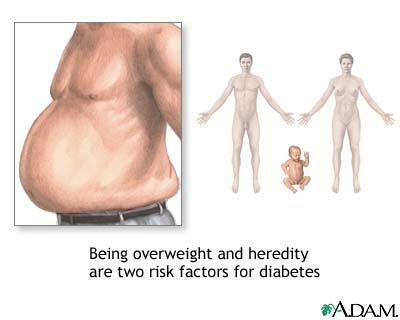 Family History: If you have a parent or sibling with type 2 diabetes you are at increased risk. History of Diabetes in Pregnancy: Nearly 4 out of every 10 women who have diabetes during pregnancy eventually develop type 2. Usually within the decade following birth. Impaired Glucose Tolerance: Also referred to as impaired fasting glucose is a type 2 diabetes risk factor that can occur prior to the onset of type 2. While those affected are not considered to have diabetes, their blood sugar is considered to be abnormal placing them at higher risk for heart disease as well as type 2. Ethnic Ancestry: Those of African, Aboriginal, Asian or Latin American ancestry are at greater risk of having type 2 diabetes. High Blood Pressure: This risk factor for type 2 diabetes is present in up to to 60 percent of people with undiagnosed diabetes. High Cholesterol: Among those with diabetes more than 40 percent have abnormally high cholesterol levels. If you are overweight and have one or more of the other type 2 diabetes risk factors listed above, you should be tested for diabetes now. If you do have it, early diagnosis is critical for minimizing and preventing the serious complications of the disease.